Brown's Ferry near Vermillion, ca. 1888. Courtesy: W.H. Over Museum, Vermillion. Most of us who are natives or residents of South Dakota have become so used to the Missouri River that we hardly think about the deep historical story behind this creation of nature. First of all, many people don’t realize that the Missouri River is the longest river on the North American Continent… a lengthy 2314 miles from the Rocky Mountains in northwestern Montana to the plains of the state of Missouri and the city of St. Louis, where it empties in the Mississippi. 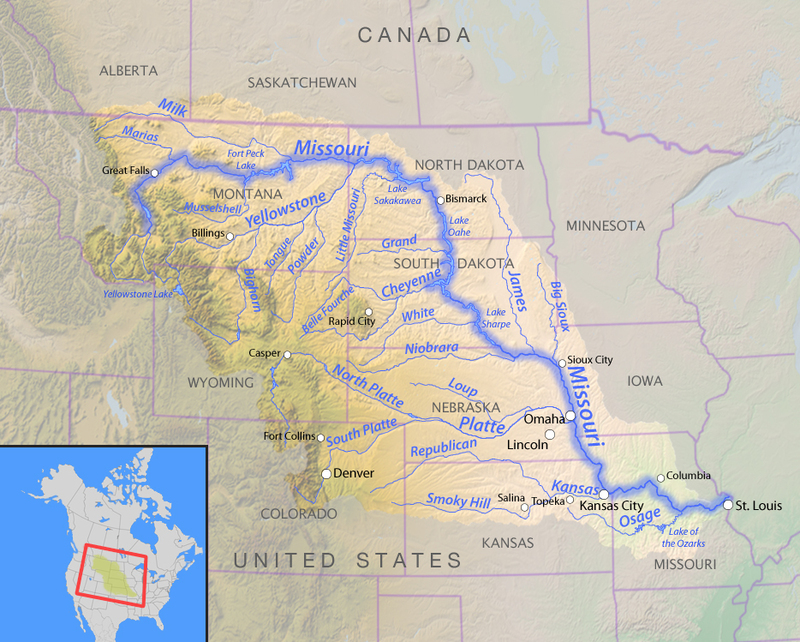 The Missouri drains water from the southern areas of two Canadian Provinces, Alberta and Saskatchewan, and drains water from rivers in ten U.S. States: Montana, Wyoming, Colorado, North Dakota, South Dakota, Nebraska, Minnesota, Iowa, Kansas and Missouri. Image Courtesy: 1881 Courthouse Museum, Custer. 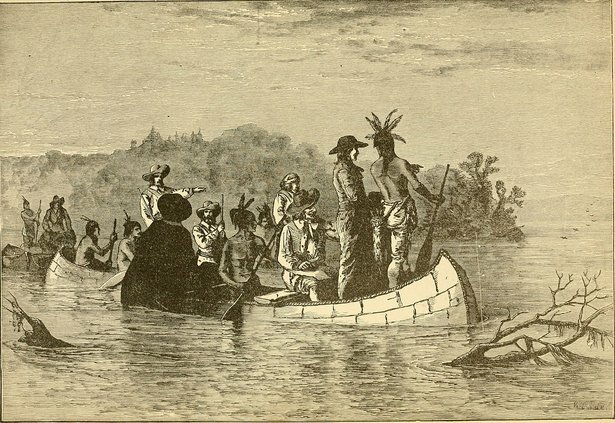 The most famous historical reference to the mighty Missouri River came in 1804, when President Thomas Jefferson dispatched Meriwether Lewis and William Clark on an epic exploration of the American West. These two explorers followed the Missouri River up into what is now Montana and then crossed over the Great Divide of the Rocky Mountains, traveling to the Pacific Ocean further west. 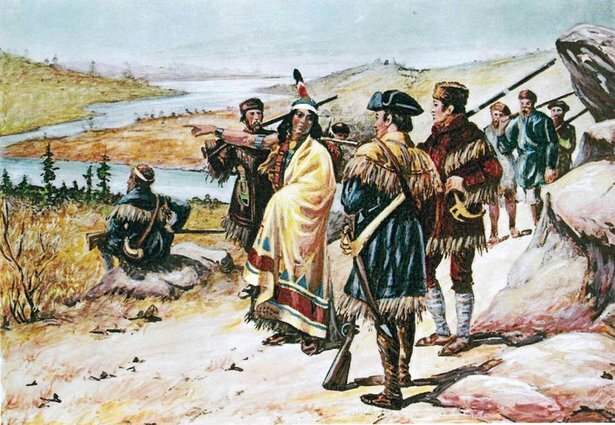 But the earliest reference to the Missouri River came from Louis Jolliet and Jacques Marquette, fur traders from France who first entered the area in 1673. These two intrepid explorers established one of the largest fur trading posts in history at what became known as Fort Benton, Montana, near Great Falls. 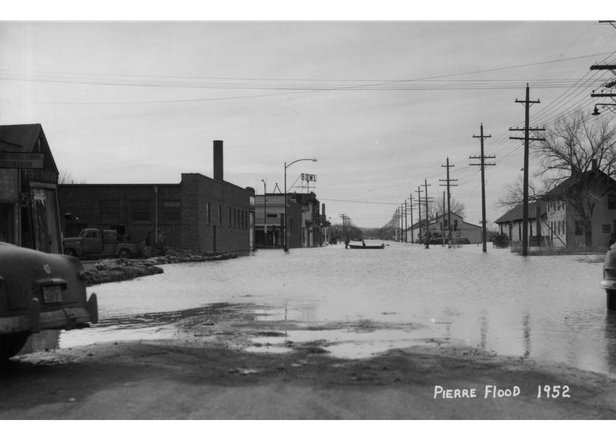 Flooded street in Pierre, 1952. Image Courtesy: South Dakota State Archives. 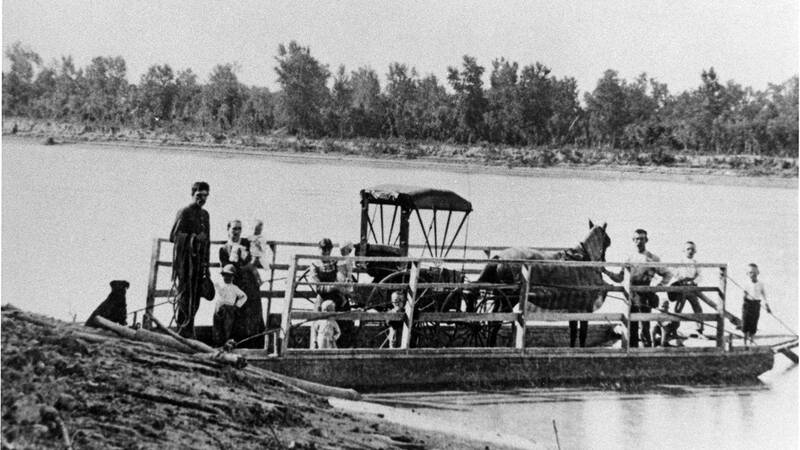 But for many of us, our earliest memories of the Missouri River came in the first half of the 1900’s when heavy snowfall in the mountain and the prairie states yielded devastating floods which annually spilled over the banks of the river and flooded the farm land along hundreds of miles along the “Muddy Missouri”. Unidentified workers at Gavins Point Dam construction site, 1950s. Image Courtesy: U.S. Army Corps of Engineers. 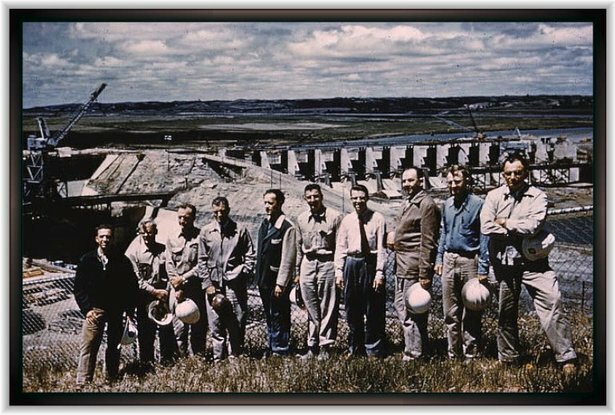 In 1944, Congress authorized the Flood Control Act, which authorized the U.S. Army Corps of Engineers to build a series of dams stretching from Montana to the Southeastern South Dakota town of Yankton. The largest of the four massive dams on the Missouri River Is Oahe located just north of South Dakota’s Capital City – Pierre. 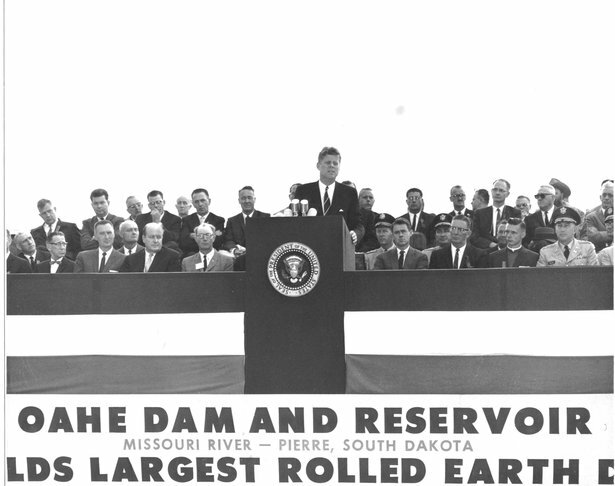 On August 17, 1962, President John F. Kennedy came to Pierre to dedicate the Oahe Dam and the overall flood control project. The Oahe dam, by the way, is the world’s largest earthen dams, meaning that the entire structure, except for the spillways, is made out of good old South Dakota earth. 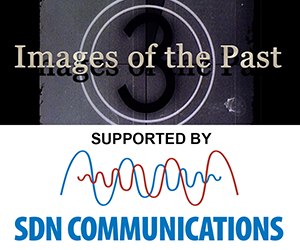 Images of the Past Building Oahe Dam Film shot between 1948 and 1959 shows the monumental challenge of damming the Missouri. There are six dams which are a part of the Flood Control Project: Fort Peck Dam in Montana. Garrison Dam in North Dakota. Oahe Dam at Pierre, South Dakota. Big Bend Dam, near Fort Thompson. Fort Randall Dam near Pickstown, and Gavins Point Dam just outside of Yankton. There are three major benefits that result from the building of the six dams, being the most commonly recognized. Water sports, swimming, boating, water skiing, sun bathing, and fishing have all exploded in popularity along the hundreds of miles of shoreline. The generation of electrical power for many towns and cities is an important benefit from the dams and flood control, which has saves towns and cities as well as farmers and ranchers and other nearby businesses all of whom benefit from the fact that while “A River Runs Through It” most of us rarely think of how we all benefited from taming “Mighty Missouri River”.